Thanks Strum, will check it out. Sitting in tonight with the high winds outside. We might have to have a beverage too. Mere curiosity. Why do they put the mound of earth on top of boards for a month or so? Excuse my ignorance but I don't go to many burials, all my good-byes are up at the fiery furnace. The chairman of the Board has to decide that, to keep the muck exposed or bury it, how much muck and for how long, that is the question? Years ago when the coffin was lowered into the hole the gravediggers would start work (in front of the grieving masses) and fill in the grave shovel by shovel of clay!! Then in Deansgrange they got a wooden cover which had a green pretend grass on it and when the coffin was lowered the wooden cover was put on and when the mourners left the men filled in the grave. "The grave shall not be filled in until after the mourners have departed"
Some of them are still with us. I thought the mound of earth stayed until the coffin collapsed in on itself and then they level the surface. Where's that terrace through the fence? Well Strum the mound of clay would be there for a very long time. The coffin takes years to decay. As Rocker said 'in the old days' the grave diggers filled the grave whilst the mourners were there. 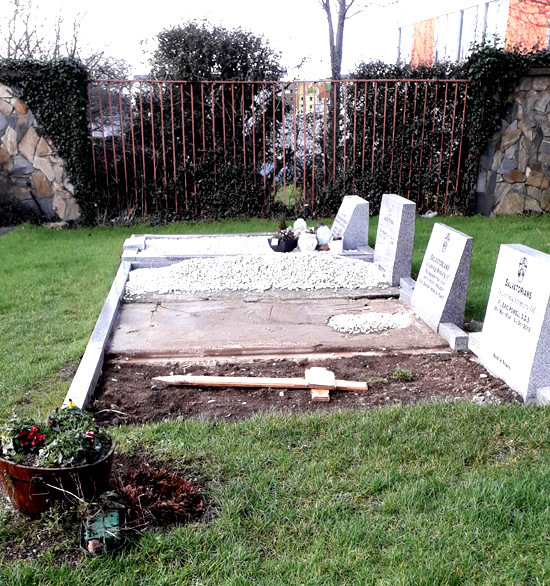 These days mechanical diggers are used and it would not be fitting for this to happen in front of the mourners hence the wooden cover with mock grass on which the flowers are laid. As soon as mourners have left and depending on the number of burials the grave is filled in.